PDF of the entire issue (7.68 Mb). The new TWAS Newsletter reflects our commitment to science communication. TWAS president says the Academy must support young researchers. How can developing world governments aid young scientists, especially women? The long-time oil-producing power charts a new course to innovation and growth. The researcher, adviser and TWAS Fellow offers a prescription for science success: commit long-term; connect research to society; don’t fear failure. How Oman’s medical care system went from terminally ill to great health. 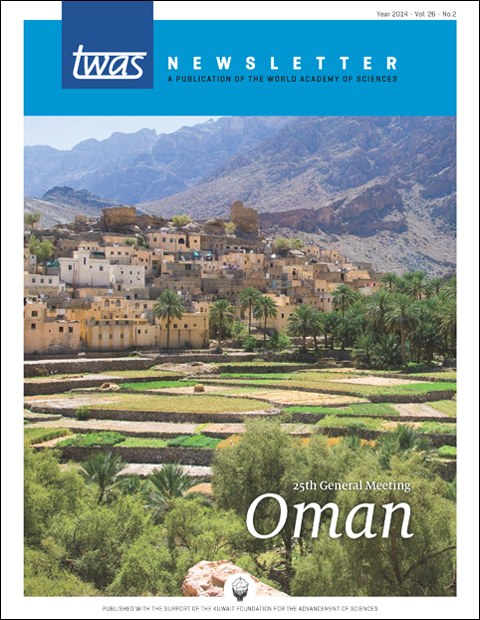 Scenes from TWAS’s 25th General Meeting in Muscat, Oman. The five-year agreement is a new commitment to diplomacy and education. A South African pioneer of research that protects women from HIV/AIDS. Mohamed Fawzy Ramadan Hassanien wins the 2014 Atta-ur-Rahman Prize. Sudan’s Muntaser Ibrahim wins C.N.R. Rao Prize for genetic research. The Research Council of Oman cultivates a new generation of scientists. In 2014, the Academy elected 46 new fellows, announced 11 winners of the TWAS Prize, and selected two TWAS Medal lecturers for 2015. Her work had a deep impact on women and development in Malaysia and beyond. She will be remembered also for distinguished work with OWSD and TWAS.